Cabbage Soup Diet Recipe with Diet One Day makes a powerful team. Diet One Day and Cabbage Soup Diet Recipe together make a powerful team. 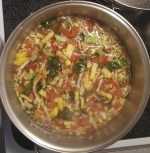 You take the diet one day at a time adding new foods each day but always eating the Cabbage Soup Diet Recipe in between or along side of those daily foods. Make up a batch to have on hand for the “On Days” of the Diet One Day diet plan. (Remember also to try some of our smoothie recipes with One Day Protein for a change of pace or when you are feeling tempted.) DO NOT substitute unless specified. The soup has a science to it and you especially may not add starchy vegetables; no carrots, plantains, potatoes of any kind, taro etc. See our list of approved veggies for the our improved cabbage soup diet recipe and a list of “better choice” fruits for your “On Days”. Eat it on any day but especially to help with hunger pangs on your diet days. Cabbage Soup Diet Recipe (The smaller the pieces the better. ) Simple recipe below or build your own soup with our approved list. 16-28 ounces canned stewed or diced tomatoes if no sugar has been added. Blend them up first if you wish. 2 yellow, orange, red or green peppers. I use jalapeno diced small but not from a jar; only fresh. 4 stalks celery chopped small; including the stalks. The stalks have a lot of natural flavor. Adding celery seed powder to the soup is tasty also. 1-2 packages Lipton onion soup mix, or any dry onion soup mix (optional) I do not use this because of MSG. Try instead of the Lipton soup mix: salt and pepper to taste with garlic salt, parsley, basil or your choice of spices. Low salt is always preferable in dieting and fresh herbs add a better taste than dry. Now cook over medium heat until it is pleasantly cooked then simmer. Lower heat preserves flavors unless you are in a hurry. add 1/3 of a bottle of v8 if you want – I like to add spicy v8 because the hot stuff always purifies the blood and helps circulation. Let me be very clear, for those who don’t care for V8. ME EITHER. I don’t like v8 generally speaking but it is not the same in this soup so if YOU don’t like it try it just once in this. It just gives it more of a vegetable soup flavor. It is not the same as tomato juice which can be high in carbs. add jalepeno and or red pepper flakes to heat it up with or without the spicy V8. add 1-2 TB fat free red or green curry paste, corriander, bok choy and ginger. This gives it a nice Asian flavor. This one is my favorite. 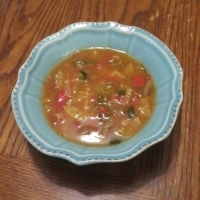 One more tip for a better tasting cabbage soup diet recipe would be to take out a couple cups of the soup when it is done cooking and blend it. This will add a different texture, not so watery. WARNING: Be very careful with blending hot liquids. Make sure there is plenty of room in the blender or better yet, I use an immersion blender and it takes seconds right in the blending cup. Voila. Eat all the bowls you want of our cabbage soup diet recipe; all day and all night. You can also have fruit but that we will talk about in another post. Looking for more recipes? Visit our recipe page for more. Diet One Day Tablets come in Chocolate, Strawberry, Butterscotch and Vanilla flavors. 2 size bottles: 100 or 200 Tablets, and for a limited time Day Packs. (60 more than other brands) So many size and flavor options make it easier to mix and match flavors and try them all. Pricing below. Visit Our Store for Diet One Day and other healthful products. Visit Our Affiliate page for more information. Earn 15% when your friends and family use your link. 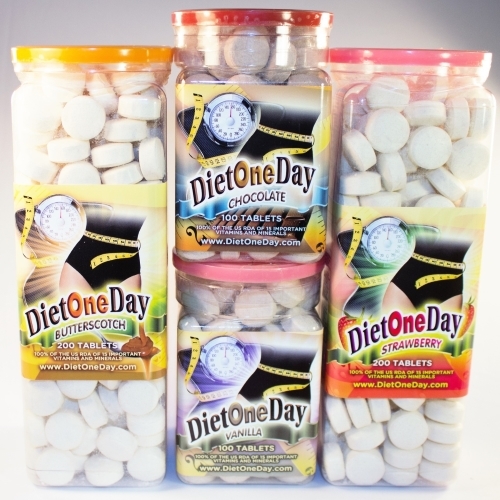 Diet One Day (formerly One Diet One Wafers) and other great products and combos in our store. Discounts in our store when you buy just 2 or more. Remember to see your choice of healthcare practitioner before making any changes of concern in your diet. One Day Diet Wafers is the former name of this product. You might find info and recipes of use there as well. and other great products and combos in our store. Discounts when you buy just 2 or more.